Slow Art Day yoga class for one Art Museum of Southeast Texas member. Slow Art Day yoga class for one non-member. Join the Art Museum of Southeast Texas for Slow Art Day from 10 am to Noon on Saturday, April 27. Slow Art Day is a FREE worldwide celebration of art that encourages participants to look at art SLOWLY – and thereby experience art in a new way. 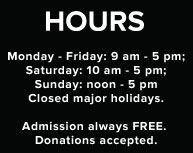 For more information, call (409) 832-3432 or visit www.slowartday.com.